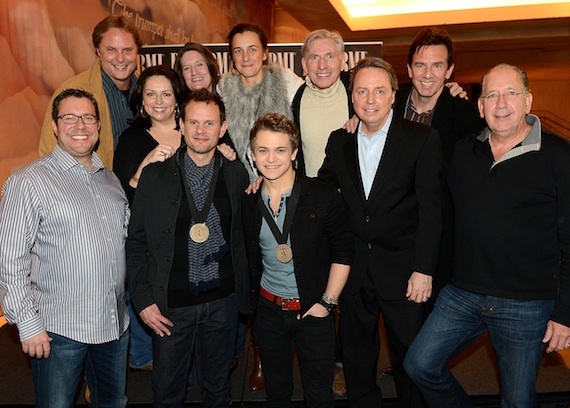 Pictured (back row, L-R): Scott Hendricks, Universal Music Group’s Cyndi Forman and Whitney Williams, Martingale Entertainment’s Betsy McHugh and Ansel Davis, and producer Dann Huff; (front row, L-R): Universal Music Publishing Group’s Kent Earls, co-writer Troy Verges, Hunter Hayes, BMI’s Jody Williams, and Warner Music Nashville’s John Esposito. “Wanted” is currently nominated for a Grammy for Best Country Solo Performance (Hayes is nominated for three Grammy Awards this year). During the event, Hayes was surprised with a plaque commemorating “Wanted” as a double-platinum single.